Drop is a very new shopping app that is similar to others but with one very important difference: it's completely streamlined. Instead of scanning receipts, you simply register your credit or debit cards and Drop will monitor what you spend at the stores you choose to get rewards from. Then a day or two after your purchases, your account is funded with points based on how much you spent and how much each dollar is worth at that particular store or restaurant. Once you have enough points to redeem for a gift card, redemption is instant so your funds are available immediately. And you don't have to do anything but shop the way you normally would. Click here to sign up! The Ibotta app is like Saving Star where you can get cash back for buying certain groceries, but you don't necessarily have to have a loyalty card. Just select which items you're going to want to redeem for that week via the app, then when you've bought them, you just scan the barcode and then take a pic of your receipt. Some of the stores Ibotta supports (and they support most) also allow for you to just use your loyalty card — no receipt necessary. You can get paid really fast — you only need a $20 minimum and they send the money straight to Paypal once you request it. If you're not already using Ebates and you shop regularly online, then you should really sign up. If you go through Ebates to make purchases at your favorite store, you can get a certain percentage of cash back on your purchases. All your money will go securely into your Ebates account once the purchase is confirmed. They are an old, reputable company and they absolutely pay on time. Saving Star is by far one of the best programs I have ever come across for earning extra cash. It's a no-brainer — if you have a grocery store rewards card, you can link it up to your Saving Star account and get money every time you buy certain items. And the best part is that you can request your money from your Saving Star account at as little as $5! Choose from Paypal, Amazon or bank transfer. You can also opt to have your earnings sent to charity if you want. Checkout 51 is just like Ibotta, but it works at ALL stores and it also doesn't have to be used via an app. You can just log onto the site online and redeem for what you bought. You need $20 to get paid and they will mail you a check once you've earned enough money. This is an app, same as Ibotta and Checkout 51, but you earn coins that you can redeem for Paypal cash or Amazon gift codes. All you do is snap receipts when you buy any of their featured offers. You need at least 1000 coins to get $5. The app is available on Apple and Android devices. This is one of my new favorites! I posted about it not too long ago. At Coupon Chief, you can actually get paid for seeking out and posting coupon codes you find. If someone browsing the site uses a coupon code that you uploaded, you'll get two percent of the sale into your Coupon Chief account. And yes, you can get credit for using your own coupon codes that you upload, so that's a way to get even more savings. 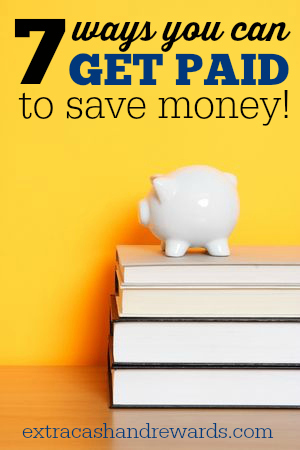 How do you get paid to save? Any other good sites?